Its history dates back to June 1941 when by a initiative of the community of Reconquista (city of northern Santa Fe province located along the Parana River), a committee was formed for the purpose of installing there a military unit. Two years later in August 1943 was authorized the purchase of land to install it in a terrain located about 7 miles south of the city. Thus, on August 10 of 1944 was established the Reconquista Military Airbase which was renamed as the Third Air Brigade five years later. There, was created in 1949 the First Observation Group which counted with domestically manufactured "Calquin" airplanes and a year later, was conformed the Instruction Center for Survival and Rescue (CISS) of the Air Force. Until 1975 the base was also operating "T-28", "De Havilland Dove", "Avro Lincoln" and "Huanquero" planes. That year make his arrival the "IA-58 Pucara" intended to make air support tasks, and currently the only remaining aircraft type still operating in the Brigade. 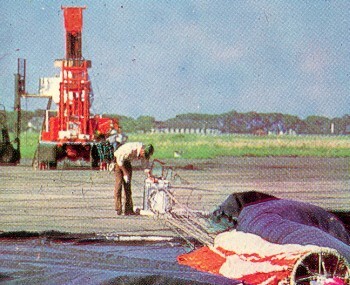 As for the activity with stratospheric balloons, the Reconquista base was used since 1978, as alternate site for the activities in the context of the national balloon program generically named as "Galaxia" carried out by the National Commission on Space Research (CNIE). Until then, the flights were performed exclusivelly from Río Cuarto or Paraná . 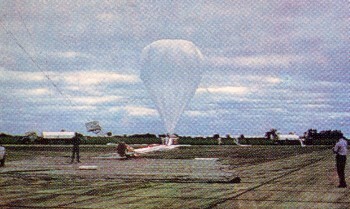 These flights took place during the summer months so once launched the balloons traveled on the prevailing winds toward the west. There were very few launches from the base. The latest records dating from 1992. Currently the Brigade serves as the basis for the deployment of Air Squads of Pucara in the Northeast region of the country in support of operations to control illegal flights (smuggling and drug trafficking) in the border area. The base also hosts Daniel Jukic airport (named after a pilot of the unit who lost his life during the Malvinas War in 1982) whose terminal dates from 1960 and is currently operated by Aeropuertos Argentina 2000, a private firm.